Homebrew synths – generating a waveform in a microcontroller, adding a MIDI interface, and sending everything out to a speaker – are great projects that will teach you a ton about how much you can do with a tiny, low power uC. [Mark] created what is probably the most powerful homebrew synth we’ve seen, all while using a relatively low-power microcontroller. The hardware for this project is an LPC1311 ARM Cortex M3 running at 72 MHz. Turning digital audio into something a speaker can understand is handled by a Wolfson WM8762, a stereo 24-bit DAC. Both of these chips can be bought for under one pound in quantity one, something you can’t say about the chips used in olde-tyme synths. The front panel, shown below, uses 22 pots and two switches to control the waveform, ADSR, filter, volume, and pan. To save pins on the microcontroller, [Mark] used a few analog multiplexers. As far as circuitry goes, it’s a fairly simple setup, with the only truly weird component being the optocoupler for the MIDI input. The software for the synth is written mostly in assembly. In a previous version where most of the code was written in C, everything was a factor of two slower. Doing all the voice generation in assembly allowed for twice as many simultaneous voices. It’s a great project, and compared to some of the other synth builds we’ve seen before, [Mark]’s project is at the top of its class. 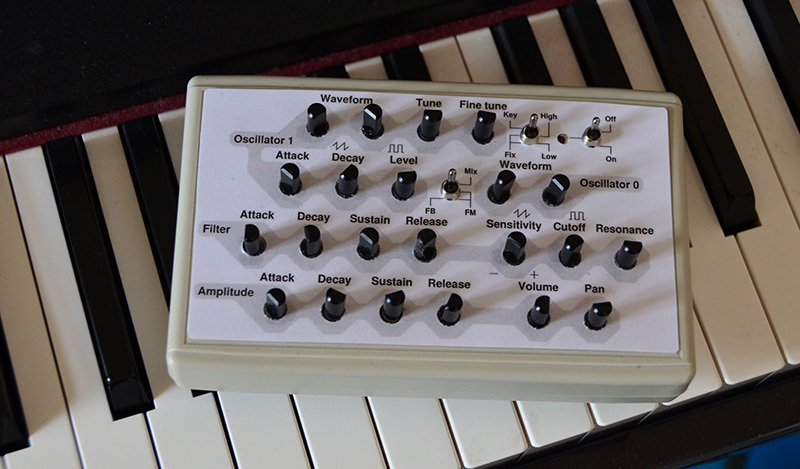 A quick search of the archives says this is probably the most polyphonic homebrew synth we’ve seen, and listening to the sound sample on the project page, it sounds pretty good, to boot. It’s almost that special time of year again where we all get together and use our families as guinea pigs for new cooking techniques and untested recipes! Some of us are seasoned pros at preparing the big bird of tradition, while others are still experimenting year after year with hopes of nailing the optimal method by chance. [Travis Mikjaniec] approaches this culinary conundrum from an engineer (of aerodynamicist)’s perspective, with the goal of scientifically discerning through simulation the best method to prepare a Thanksgiving turkey; no long term trial and error required. As the basics of cooking dictate, the rate at which the meat of a turkey will cook is determined by where the hot air is flowing and gathering inside the oven. Areas of the bird subjected to consistent fresh heat will cook faster and are more likely to dry out over time, so it’s important that the hot air is equally dispersed for an evenly cooked, juicy turkey. To figure out the trajectory of the air and the point where it begins to cool down, [Travis] modeled the naked bird in CAD, complete with the hallow cavity within. He then recreated the baking conditions to use in FloEFD, in this case a standard convection oven with a fan located in back. To compare cooking techniques against one another, he ran a series of streamline simulations with combinations of different cooking variables, like how high the bird was lifted off the baking sheet and whether or not the inner cavity had the added thermal mass of stuffing or not. These chaotic diagrams of simulated air flow helped visualize which conditions were conducive for even heating. If you’re interested in knowing the verdict of [Travis’] trials with virtual turkeys, he offers thorough documentation on his investigative blog post. His insight might help improve your cooking game plan for Thanksgiving or teach you something you didn’t know about the aerodynamics of a fifteen pound headless bird… which is something you can talk about while sitting around the table.